Nokia Steel HR is a stylish, classy hybrid smartwatch with the ability to track sleep, runs, swims and more. There is no GPS on board, but has a heart rate monitor, as well as the ability to receive smartphone notifications. It also has a silent vibrating alarm and a Smart Wake-Up feature that helps you wake up at the optimal point in your sleep cycle, so you feel alert and ready to take on the day. Is this the ideal smartwatch for you? 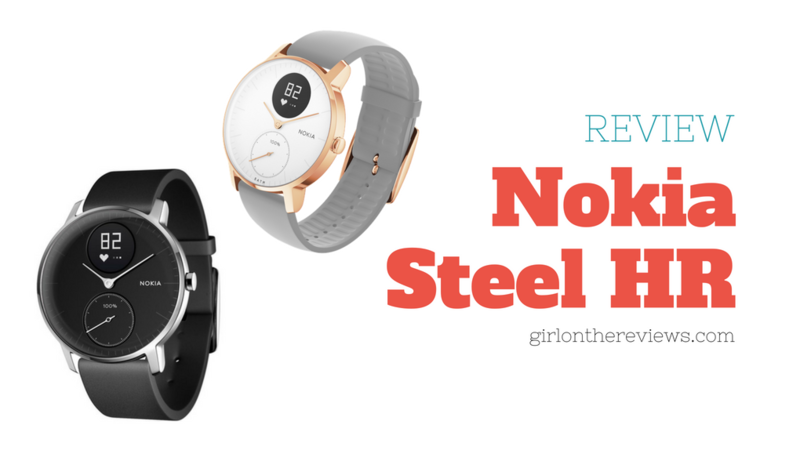 Check out my full Nokia Steel HR Review below! The Nokia Steel HR comes in two sizes, 36mm and 40mm. Although both watch face are the same in size and function on both variants, the 40mm or larger model appears more masculine due to its thicker bezel and is available only in black watch face and gray case, while the 36mm or the smaller one appears to be more elegant and more feminine with more colors to choose from like gray or rose gold case or even white or black face. You can even opt for leather or woven bands if you want something a little more dressy. In any case, no matter what size you choose, Nokia delivers a nice look. It has a black silicone band that is stylish and comfortable on the wrist. The bands have quick release bars, making them easy to switch out. Nokia HR opted for mineral glass as protection for the watch which offers minimum glare. It also has A digital display which is a small, circular OLED subdial at the top center of the watch face. All you have to do is tap the crown, and the OLED display will scroll through your tracking data. It has a mechanical watch hand with an activity subdial on the bottom and an OLED subdial on the top that offers call and text notifications and appointment reminders from your calendar. Just tap the crown and you can get quick access to your current heart rate, steps walked, calories burned, and distance traveled. It also has a magnetic charging dock and a rubberized bottom to the dock to keep the dock from sliding when you place the watch on it. The watch easily clicks into place and is not easily dislodged. Nokia Steel HR has a fitness and sleep tracking ability that distinguishes it from other hybrid watch competitors. While it looks like a hybrid watch, Nokia HR has built-in heart-rate tracking and is water resistant up to 50 meters. Nokia Steel HR can also track your sleep patterns. The function is great, providing data on total time laying in bed, sleep duration, how long it took you to fall asleep, heart rate, and the number of times you woke up. The watch automatically tracks your sleep, so there’s no need to do anything to trigger the feature. It’s an easy way to get relatively accurate data about your sleeping habits. It even offers up guides from experts on how you can improve your sleep through the Health Mate App. Based on the score you receive, you can easily see what you’re doing that’s causing fatigue and what to do to improve it. It also has the Smart Wake-Up feature that identifies the best time to wake you up to avoid these feeling of irritation, confusion or grogginess, allowing you to wake up more smoothly and feeling refreshed and well-rested. The battery life with the continuous heart rate function turned off, it will go on for up to 25 days. It takes about two hours to completely recharge the Nokia Steel HR. The Nokia Steel HR comes with a one year warranty and is available online and at many major retailers. Given my Nokia Steel Hr review above, this is a great option if you’re the type of person who uses a smartwatch or hybrid watch primarily for health tracking. It’s accurate, provides excellent data visualization through Health Mate or third-party apps, and best of all it’s actually more attractive than most fitness trackers. The OLED screen, great battery life, and accurate fitness and heart rate tracking capabilities make it an easy solid choice. Depending on what you are expecting, if you’re looking for a watch that can store music and more refined notifications on your watch, Nokia Steel HR is not for you, however, if you’re looking for an attractive hybrid watch with excellent fitness tracking abilities, then yes, the Nokia Steel HR is the perfect choice. What are the important reminders for Nokia Steel HR water resistant feature? Nokia Steel HR can withstand a pressure similar to that of a 50 m (165 ft) depth. You can, therefore, use it when dishwashing, splashing or swimming. However, it can’t be used for diving or snorkeling. Do not press the button when it is under water. Avoid long exposure to salt water and make sure you rinse your watch with fresh water after spending time swimming in salt water. Avoid exposure to any chemical products such as solvents, detergents, perfumes, and cosmetics. They may damage the wristband or the casing of the watch. What should I do if there is condensation inside my watch? If condensation has appeared inside of your watch, please reach out to Customer Service by clicking the Contact us button at the bottom of the page. To help expedite your case, please send a photo of your watch showing the issue along with your support request. How do I clean my Nokia Steel Hr? Use a lint-free cloth moistened with warm water to clean the glass and casing of your watch. Run the silicone band under warm water and rub it with hypoallergenic soap to clean it. dry the silicone wristband with a soft cloth. Note: If the button of your Nokia Steel HR appears to be stuck, we advise you to rinse the casing of your watch with clear water and dry it using a lint-free cloth. Good: Nokia Steel HR’s clean and well organized and intuitive app interface is quite impressive. It helps make finding data very simple. It has an attractive design that is stylish, elegant and compatible with standard sizes of watch bands. It also has a good selection of health programs and a heart rate monitor that is accurate. At my current usage and at the time of writing this Nokia Steel HR Review, battery life is excellent as it can last up to 25 days and recharging the watch only takes less than two hours to get full charge. Not so good: The biggest drawback of Nokia Steel HR is its lack of music storage, which is a feature in many fitness trackers. The distance measurement is inaccurate and the notifications are limited. Also, the mineral glass that should protect the watch is prone to scratch. The notification alerts are rather basic, as it’s largely meant to show calls, texts, and calendar alerts — it’s not as solid as many other hybrid smartwatches.